This event is generously sponsored by University of Iowa Health Care, the American Foundation for Suicide Prevention and Lensing Funeral & Cremation Service. Live Through This is a collection of portraits and true stories of suicide attempt survivors across the United States. 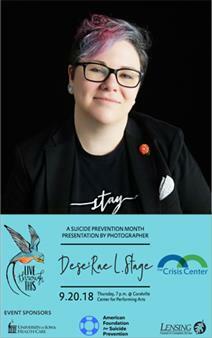 This Suicide Prevention Month, join The Crisis Center for an artist talk by Dese’Rae L. Stage, creator of the project. Live Through This reminds us that suicide is a human issue by elevating and amplifying survivors’ voices through raw, honest stories of survival, and pairing them with portraits—putting faces and names to the statistics that have been the only representation of attempt survivors in the past. Dese’Rae has received several awards for her work, including the SAMHSA Voice Award, the SXSW Community Service Award, Investigation Discovery’s Inspire a Difference Everyday Hero Award, and the American Association of Suicidology’s inaugural Transforming Lived Experience Award. Live Through This has received media coverage from TIME, New York Times, CBS Evening News, and NPR.